Moong dal or green gram is the second most important food that should be consumed daily according to Charak samhita. There are normally 5 most popular pulses used in cooking – Moong dal(green gram), masur dal(red lentils), tur dal (pigeon pea), channa dal(chickpea) and urad dal(black gram). Ayurvedic features of Moong dal – kashaya(astringent) and madhura(sweet) rasa, dry and produces drying effect in the body, cool in temperament, Katu vipaka (primarily produces fats after digestions), light to digest, Vishada (eliminates mucus), decreases excess Kapha and Pitta dosha. considered to be the best of pulses in Ayurveda. Moong dal is the easiest to digest among all the other pulses. It does not tax the digestive system, therefore it is the preferred dal for making khichadi. Khichadi is a combination of rice and moong dal cooked together. It is an ideal meal for the sick and recuperating people. Normally digestion of the sick is weakened and they are not able to extract nourishment from rich and heavy food. Moong dal is kashaya and madhura in rasa. It has a cooling effect on the digestive system. Therefore, it never causes or aggravates acidity, peptic ulcers, skin disorders, blood disorders, fever or any other kind of pitta related disorders. Moong dal does not aggravate or causes any kind of kapha disorders like cough, cold, congestion etc. because of its dry and vishada (clear, anti-mucus) nature. All the dals, including moong dal, should be cooked in excess water in a open pot. It is advisable not to use pressure cooker for cooking dals. When the dal starts getting cooked, some froth forms at the top of the vessel. You should remove this froth once or twice in the beginning. This froth helps to eliminate the drying effect of dals. Once the froth is removed, sprinkle little turmeric powder and let the dal cook on slow flame. Drying effect of moong dal can be moderated by tempering it with ghee and digestive herbs like asafoetida, curry leaves, cumin, turmeric etc. 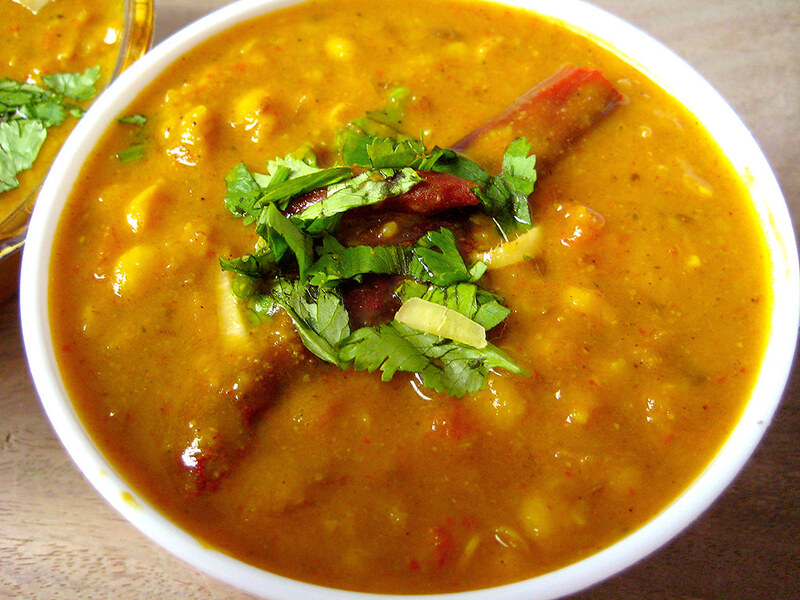 It is always advisable to eat dal with ghee or oil tempering. Adding a tsp of ghee to dal enhances the taste as well as prevents the drying effect. Ghee is also considered a “yogavahi’ or the vehicle of nutrition. Ghee also is said to kindle the digestive fire. Anything consumed with ghee gets digested and assimilated properly. Like rice, moong dal can be consumed along with most of the edibles like meat (dal mutton), dairy (moong dal halwa), vegetables, grains etc.